Other versions: PS3; X360; PC; OUYA. 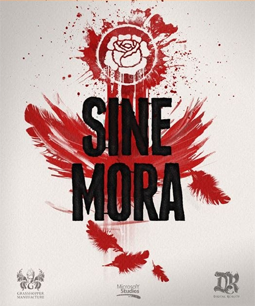 If the Vita’s troubling sales are to eventually pick up, a few more games in the spirit of Sine Mora certainly wouldn’t hurt. Make no bones about it, Sine Mora can be absurdly difficult at times, but Digital Reality’s shoot ‘em up amounts to a beautiful fusion of modern and old-skool gaming sensibilities. Beneath some sensational presentation beats the heart of a pure, streamlined retro-orientated experience with a slew of cool ideas, in a genre that seems so perfectly suited to the portable, that you can’t help but wonder why there hasn’t been a flood of such games since. A blaster in the mould of Gradius and R-Type, Sine Mora is something straight from an arcade gamer’s dreams. 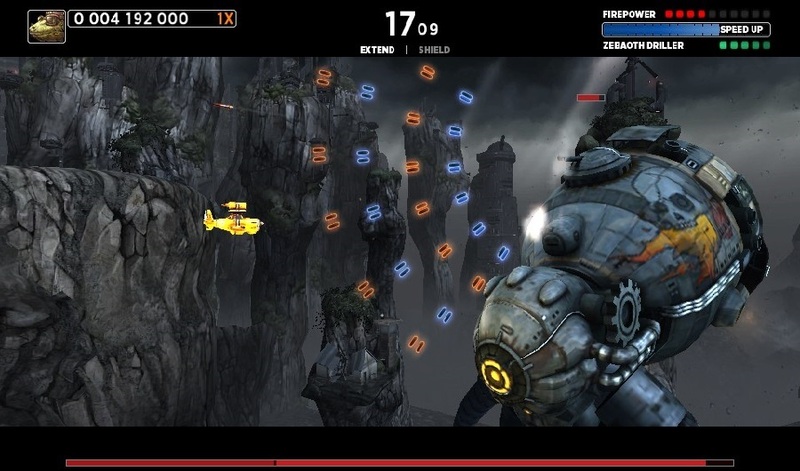 Huge, devilish boss fights dominate the game’s seven stages as the player sets about systematically dismantling mechanised octopuses, turret-packed trains and city-sized floating warships. Whilst these inevitably form the main brunt of the challenge, there’s a glut of bullet-hell set-pieces to enjoy in between, along with stacks of power-ups. It’s all you’d expect it to be, but there’s an awful lot to admire. Sine Mora stands out instantly because it looks and runs like a dream. As soon as the gorgeous whitewash title screen is unveiled along with its stark, menacing musical accompaniment, you sense this isn’t your run of the mill retro-revivalist. That would be an understatement, as it’s likely one of the prettiest side-scrolling shooters there has ever been, on any format. When the prologue stage begins, you’ll gawp at the incredible clarity of the backdrops that play host to a vicious cacophony of battling warplanes. But it’s just getting warmed up. Through beaches, cities and fiery caverns the action travels, even having time to show off a little with a luxurious underwater segment. It saves the most extravagant stuff for the second half however, as Mirage Mountain realises the full extent of the developer’s ambitious landscape design, with grand canals and gigantic statues that see waterfalls cascading from the mouths and eyes of their deities. At times, you have to force yourself to remain focused on the action itself. If Mirage Mountain acts as a beautiful homage to steampunk, then penultimate level Tira is an equally fitting ode to cyberpunk; resplendent in a neon-drenched delirium of explosions and lights. Every locale is a work of art, with rich, layered backdrops, impressive foes and tangible variety. It isn’t just a pretty face either, losing nothing in translation in what is a truly excellent Vita port. 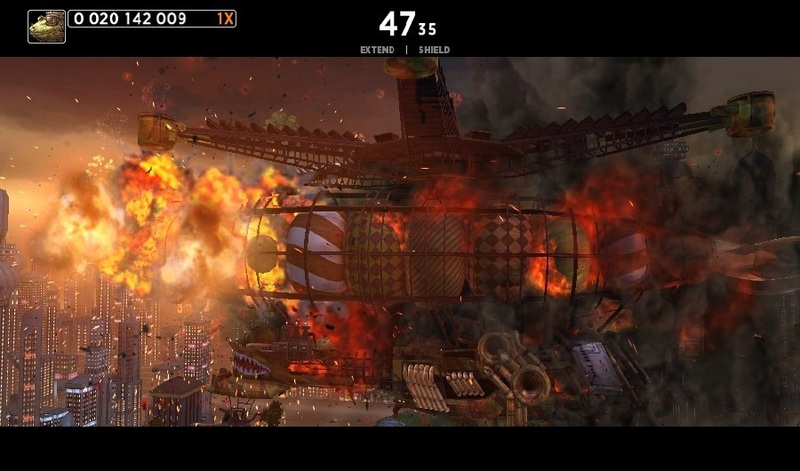 Sine Mora is as smooth as silk; the frame-rate consistently high, the controls flawless. It pioneers some largely successful new ideas too. Rather than having a health bar, the player starts with a block of time, which depletes in chunks as you take hits. Shooting enemies or taking out sections of bosses replenishes said timer, so the faster and cleaner you power through a level, the more points there are up for grabs. The story is admittedly somewhat impenetrable, though as anyone with any experience of the genre will attest, that isn’t especially important. It’s all about the gameplay, and Sine Mora has it in spades. As well as the more familiar genre power-up staples, the player is granted some unusual defence mechanisms to provide some respite from the hail of bullets. This is where more modern tropes lend a hand, including the ability to slow the surroundings so as to manoeuvre through heavy enemy fire; roll back time to erase any hits taken, or put up a reflective barrier that sends enemy fire back where it came from. These are precise and balanced utilities, all capable of helping aid big high-scores, depending on player preference. Playing on Normal offers a firm test and the seven levels prove a pleasure, though there is the odd instance (most notably the stage three boss) where the difficulty spikes uncomfortably. Finish Normal difficulty in Story Mode and you can have a crack at Challenging, which does exactly what is says on the tin, offering tough but manageable levels occasionally unhinged by the occasional crushing boss fight. For the average human being, this is likely as far as your skills will take you. Unfortunately, the Arcade and Score Attack modes cannot be played on the standard Story mode difficulties, instead limiting you to the uniquely unappetising choice between Hard or Insane skill settings. Tight time limits and bosses that positively vomit bullets mean even the early levels are a suffocating prospect, as realistically taking more than one hit will end your chances of finishing them. It’s a bit of shame really, as the ability to assemble a specific combination of pilots, crafts and power-up combinations makes Sine Mora feel unusually customisable for a scrolling shooter, and the cross-platform scoreboard it shares with the PlayStation 3 version is a definite boon. Sine Mora is a tough game for the layman to love because you have to be really, really good at this type of game to get anywhere outside of the Story mode, and extensive practice doesn’t always yield progression. But it’s an easy game to appreciate, because it’s superbly crafted, looks a peach and loses none of its allure in transition to the small-screen.